I was browsing Our Stevenage when I saw the photos of sculptures in Symonds Green. 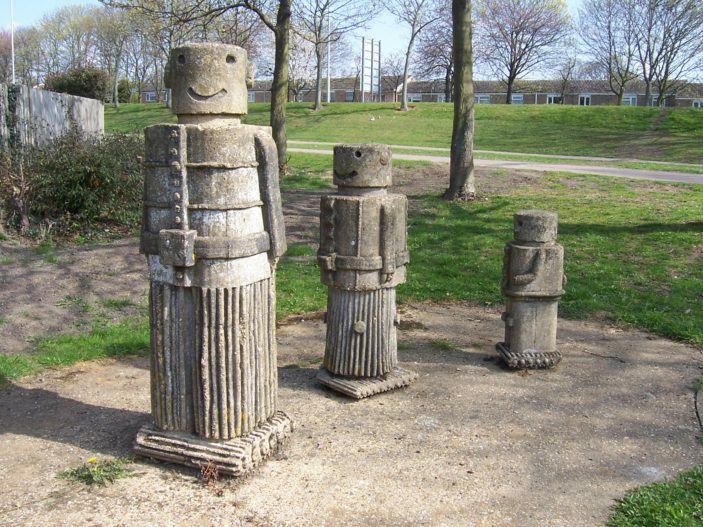 In 1976 I was Assistant Town Artist working with Simon Jones who created the Robots and the other quirky sculptures in Symonds Green – the abstracts, the teardrops and the playing cards etc.. I made carved out moulds of sea creatures and shells for some concrete walls in the area – I hope they are still there?? The day the concrete was poured into the shuttering for the walls was brilliant – such an event! See pages 14 and 15 of Concrete Quarterly 1977. This page was added on 02/05/2015. Hi just to let you know Stevenage is 70 years old this year and as a birthday project Symonds Green Scouts along with the sculptor are going to give the statues a lick of paint.